I have added some fluids in the Jump Blast game. They work as tiles like the rest of the game sprites, and have seamless animations to do the trick. It’s not has pretty as physics fluid, but it’s much less CPU consuming, so it’s good for mobile devices. 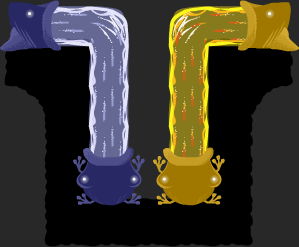 On the left, a simple water fluid that will give the player a hard time going through. On the right, the liquid lava fluid will be slower and easier to avoid, but will hurt the player. This entry was posted in AS3 development, Graphic design, Jump Blast.